To know how to best explain freelance or contract work, take inventory of your specific role and accomplishments. How long have you done freelance work? Would work be “worthy” of your resume if you had done it for an employer? Does it relate to your field or area of expertise? Does it show expertise in areas that other jobs might not? Do you feel comfortable talking about the work or companies you did work for and would they speak about you in a flattering way? How you list these jobs can vary and how you decide to list freelance projects can depend on the type of work you do and the frequency of such jobs. Freelance work should be listed on your resume just like other jobs – in reverse chronology (newest on top) and in a consistent way. When it comes to actually listing your freelance projects, start with current projects or clients and move through to less recent projects. This type of listing often works best when you do freelance work fairly consistently for a handful of regular clients. Long-term freelance jobs can stand alone just like any position with any other company. You can list this type of work as you would any other “regular” job, just make sure your position or title is clearly labeled. You do, in fact, work for said company, just not as a full-time employee. One consideration here is always whether the company will acknowledge you. Make sure the point of contact is someone you have worked with at the company because your name and information is unlikely to show up in an employment verification check through human resources. This option works great for a regular cluster of clients. It’s best if that number is small though. Listing more than a couple of current employers can look a little strange and be a red flag. If you are doing work for a variety of clients, the business name might be your own – especially if you are already incorporated. (If you don’t have a business name and are doing a lot of this type of work, this might be the time to look at formalizing the business.) The other option is to list freelance work under a “business name” that is as simple as “Freelance Designer.” The list projects or types of freelance work just like you would under a formal business name. A job title should be easily identifiable by others and help provide an explanation of what you do. Sadly, “freelancer” sometimes comes with an unfavorable connotation. Consider other title options for yourself that might come across better to potential clients or employers. If you have a history with freelance work that extends beyond a few jobs, add a standalone section specifically for freelance jobs. While you can format it in a number of ways, opt for simplicity. Start with a simple title such as “Web Design Consultant.” List the number of years you have done this type or work and any relevant certifications or training. Then list some of the companies you have completed projects for. (Here’s a tip: Especially with design, check what the company is doing now in terms of visuals and if it is not the stuff you helped with or if it does not look good or modern any longer, don’t list it.) When it comes to companies that don’t have household names, consider a few words explaining what the company does. Limit projects to a few that are different in scope and showcase your talents. Include a short description, client information and URL if applicable. If freelance work causes a potential client or employer to ask more questions than it answers, you might consider leaving that work off your resume. The other exception is confidential work. If you are working for a company and are not supposed to name that company, do not list those freelance jobs without talking to the company first. Sporadic freelance work, such as you did one project and decided freelance work was not for you. If you are not proud of the projects completed. 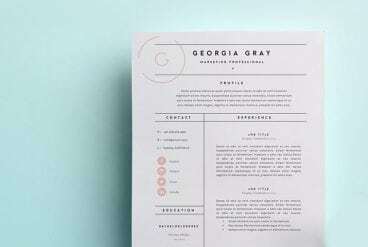 Including freelance work on your resume can be somewhat tricky if you overthink it. To make things easier, think of freelancing just as you would any other job. Include projects, companies and positions that are relevant for the person or company getting a copy of your resume. (You can include more on online versions or LinkedIn where you don’t have to worry as much about space.) List positions and work that is most suited to you and your skillsets. Note: This post is packed with various resume templates — click on any design to grab that template and use it to create a beautiful resume! (Or you can view our list of the best resume templates available to start from.